Let Tile Giant help transform the most sociable room in your house with our huge range of kitchen tiles. 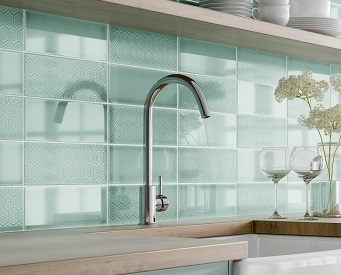 Featuring smart bevelled tiles to stylish splashbacks. 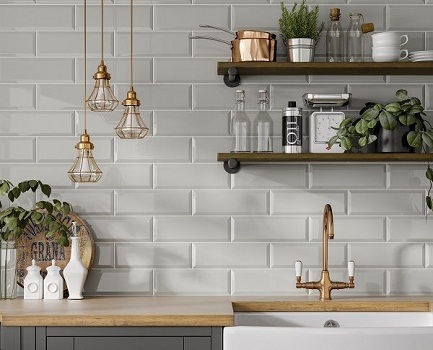 These brick metro tiles are 10mm thick which allows for a more defined bevel on the edges, which helps create a frame in the centre of the tile. 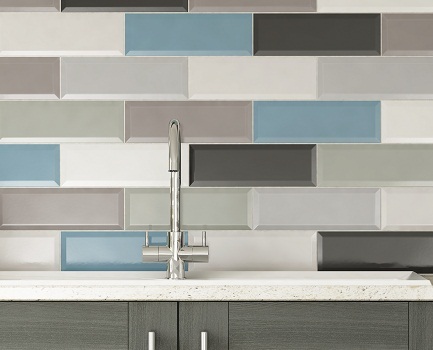 We recommend ordering a sample so you can truly appreciate these beautiful wall tiles. 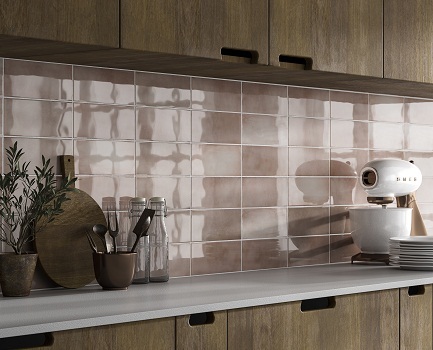 With their rich translucent glazes and subtle variations in shade and tone, these ceramic wall tiles are perfect for creating a look that’s contemporary yet has a retro edge. 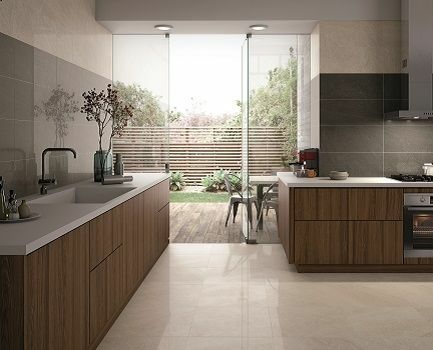 This low maintenance stone effect lappato glazed porcelain is suitable for walls and floors and has a contemporary natural look, bringing warmth and style to any room setting. The range comes available in four neutral blended tones and are available in two sizes enabling you to carry the colours through your kitchen walls and floors into other living areas. 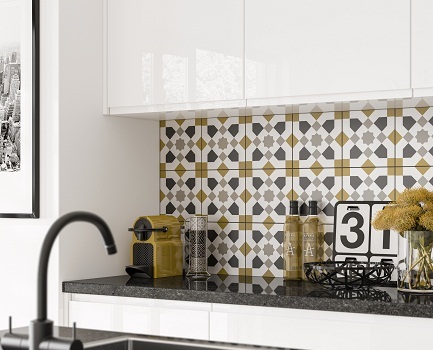 Bring natural style to your kitchen with these contemporary multi levelled tiles. 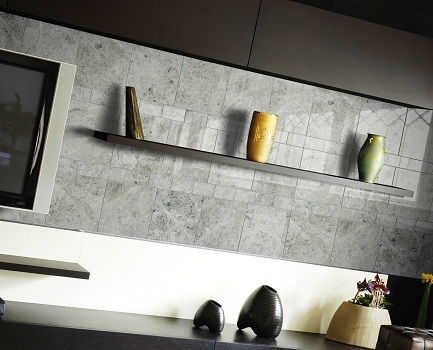 This on-trend range imitates natural stone split face mosaics using modern inkjet technology. 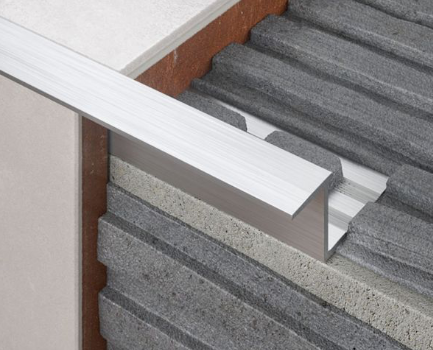 The advantages of these over their natural equivalent are they require no sealing and can be used in wet areas including shower walls and bathrooms. 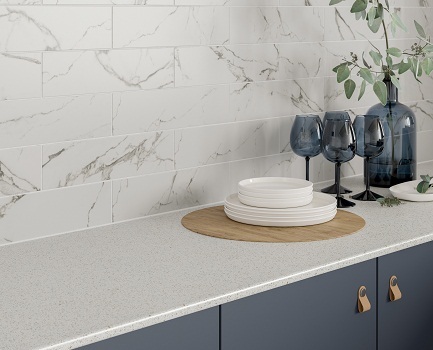 Combining subtle patterns with a softly worn appearance, these elegant porcelain wall and floor tiles will create a real a design statement in any room. The soft blue shade especially lends itself to bathrooms, whilst the grey colour option offers a more neutral look. The handmade appearance of the Cottage range will give any room a rustic, vintage feel. 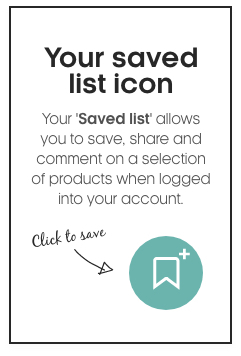 Available in classic white and grey plus a palette of soft pastel colours, you can also choose between classic gloss or contemporary matte finishes, or why not combine both? Evoking the mood of sunnier climates, Formentera offers a vast array of design possibilities. The Geo, Petal and Trellis designs are available as single patterns that can be used individually or mixed together to your heart’s content, whilst the Warm Patchwork Mix combines five different patterns into one mixed pack. 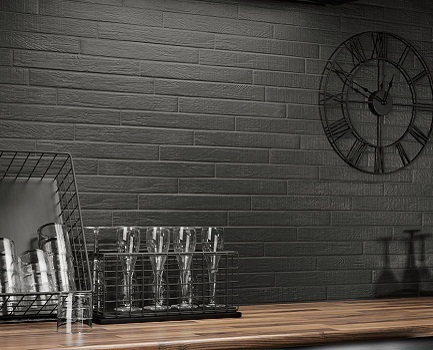 A timeless classic, these stone effect wall tiles are ideal for kitchen splashbacks but can also be used in any room throughout the home. They offer the look of natural stone but in simple to install, low maintenance ceramic. 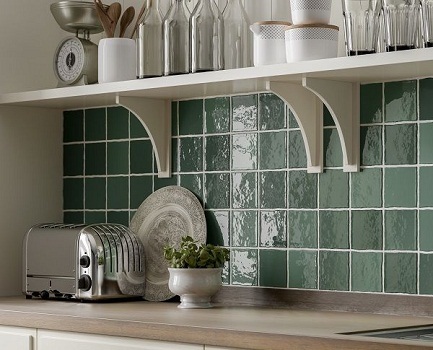 Give your home an elegant finish with the Chalkwell range of ceramic wall tiles. Featuring a palette of soft muted colours in a flat matt finish, they’re the perfect finishing touch for classic kitchens and bathrooms. Why not try mixing a blend of shades together for added interest. 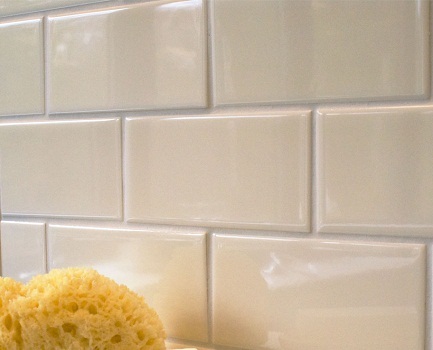 The gloss finish of these stylish white wall tiles really catches the light. 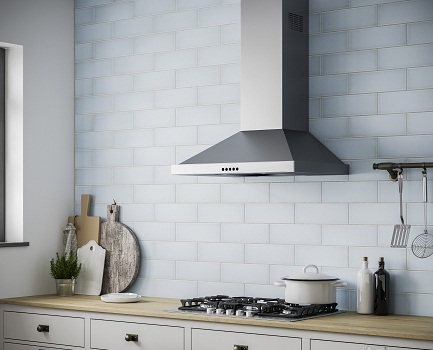 Available in two sizes, the range features a plain gloss white tile and a choice of two patterns in a textured finish, which you can combine to create your own unique design. 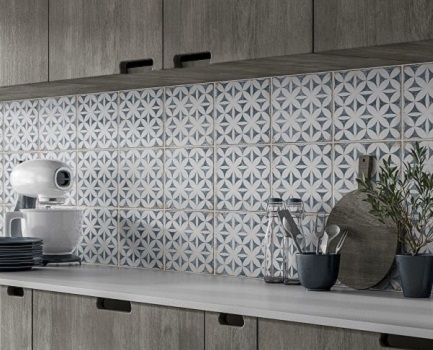 These Italian ceramic wall tiles offer a unique design-led look. 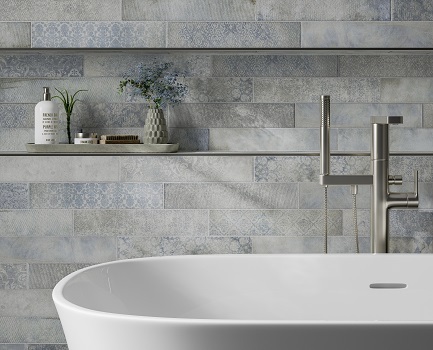 Each tile has subtle variations in tone, whilst details such as shaded edges and a faint crackle effect in some areas give them an almost industrial vibe. 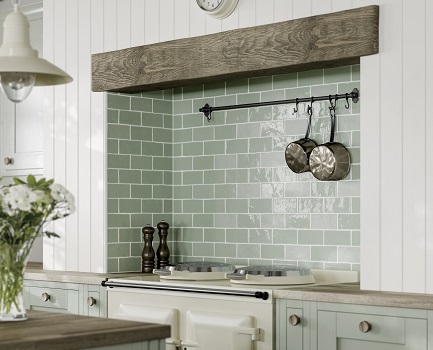 The rustic finish, square format and rich glazes of Marlow offer a look that is traditional yet on trend. For those who prefer a clean and simple look, white and cream are solid colours. The other colour options feature a blend of tonal shades to emphasise the handcrafted feel. 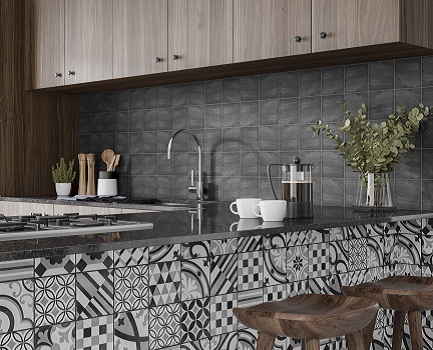 Give your home wow factor with these patchwork patterned tiles, which feature a random mixture of 15 different patterns. Their gently undulating surface and edges gives them an artisan feel. Available in a choice of shades, with co-ordinating plain tiles to complete the range. 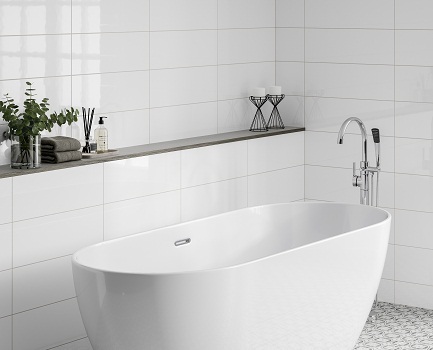 Create a more glamorous bathroom or kitchen with this modern alternative to Metro tiles. 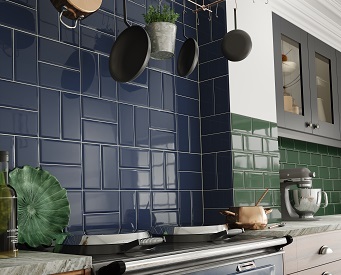 This range of bevelled ceramic tiles comes in a fantastic range of colours. Combining traditional patterns with a clean, modern finish, the Adorne range offers a choice of designs to make a real feature of your floors. 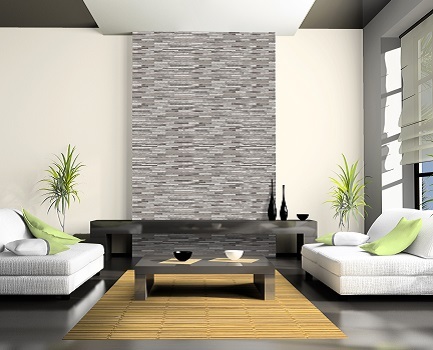 Also suitable for walls, these durable porcelain tiles can be used in any room throughout the home. Sometimes less is more, and the simplicity of a crisp white finish is hard to beat. 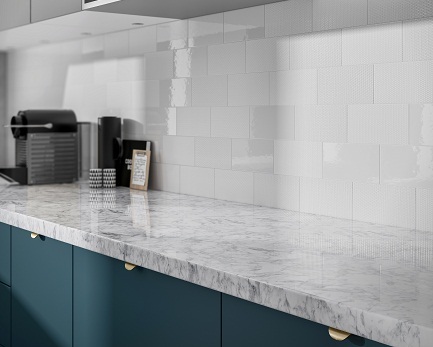 Suitable for walls in any room, these ceramic tiles are available in a range of sizes and both matt and gloss finishes for complete versatility. Nordik is a stunning range of glazed porcelain wood effect tiles. Suitable for both walls and floors and available in two different sizes in six colours, this range will inspire you to do any project. Try mixing and matching the colours and sizes to create your own unique look. Any bathroom,kitchen or hallway can be transformed using these wood effect tiles. 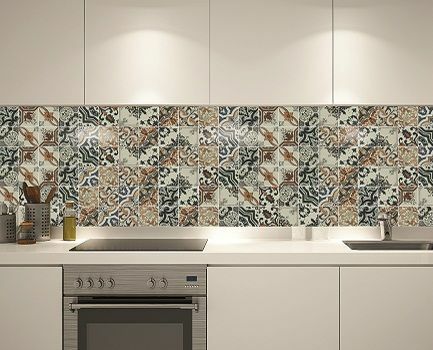 A traditional encaustic tile, the Nikea range is highly decorative making a beautiful statement in your home. 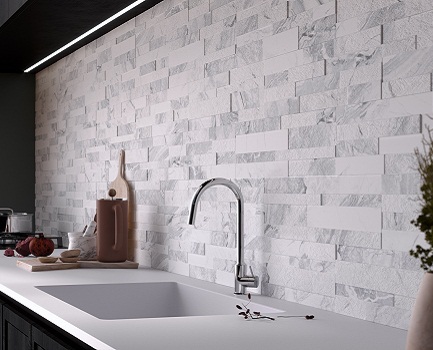 These porcelain wall and floor tiles are suitable for your kitchen or bathroom to bring an element of movement and style to a space. Choose from cool greys to dramatic brown and dark navy to suit your taste. An exquisite range of light grey marble tiles that brings with it an ambience of elegance and authority. 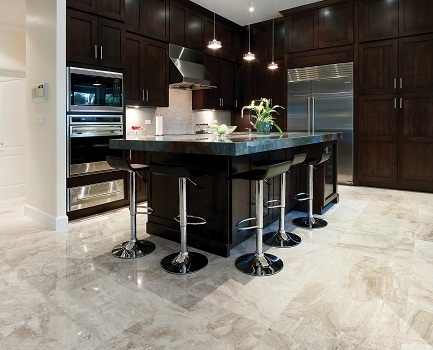 One of our prized grades of tumbled and polished marble to add a luxurious stamp on any kitchen. Every marble tile is unique with varying veins of grey and white. A beautifully engineered tumbled marble range complete with a modular opus pack to continue that timeless look throughout your home. These cream marble tiles can be used on walls and floors. Each tile is unique with varying shades and veins within the tile. Break up large spaces and use the change in texture and tone to create an interesting design with our range of trims. 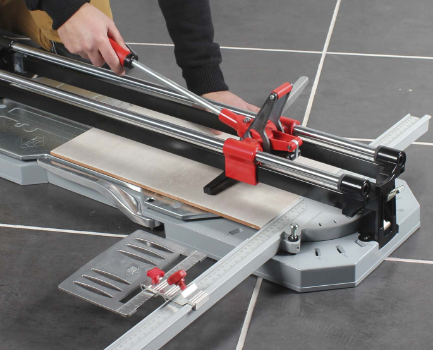 Whether you’re looking for cutters, spacers or cleaning and maintenance products, you’ll find everything here. 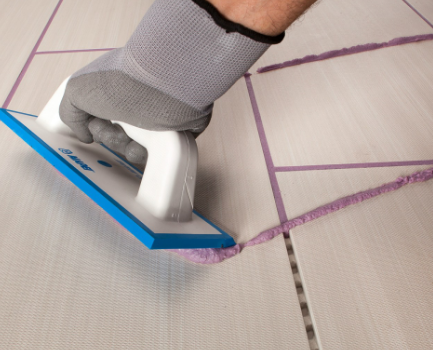 Make sure you have the right adhesive or grout to get the job done.